In compliance with recommendations of The National Institute for research and Safety at work (I.N.R.S). Especially designed for acid and bases storage. Built in cellular PVC with a great resistance to vapour aggressions and corrosive liquids. Cabinets with sliding drawers for acid or/and base storage. Built entirely in white cellular PVC. "Corrosive", "Base" and "Toxic" large warning labels (only the 3 for APC106 model). 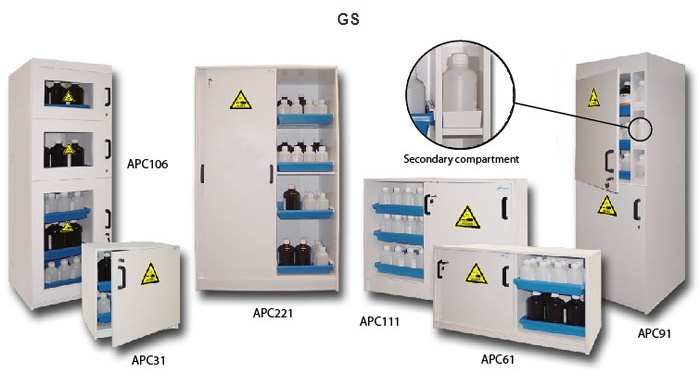 Independant compartments (except APC31 model) for acid, base or/ and toxic products storage (only for APC106 model). Each compartment is divided in a major and a secondary storage area (except APC61, APC111 and APC221 models). High and low opening vent Ø 100 mm with connecting piece for possible exhaust. -Handling door(s) for APC31, APC91 and APC106 models. -Sliding doors for APC61, APC111 and APC221 models.